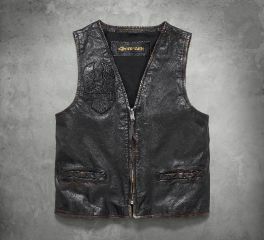 Nothing says 'biker' quite like a classic Harley-Davidson leather motorcycle vest. They look great over denim jackets and T-shirts for year-round wear. Check out our leather and chain vest extenders for a custom look and fit. 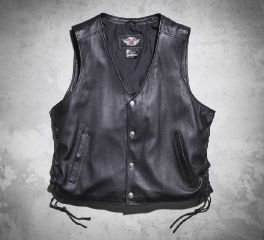 Stay on the top with this Men's Black Tradition II Leather Vest. It features a V-neck and snap front, two vertical snap pockets, embroidered graphics on left chest, and adjustable side lacing. 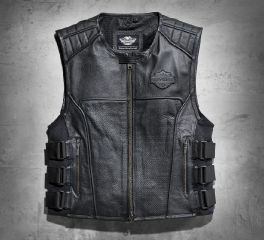 Perforated genuine leather makes the Swat II Leather Vest incredibly breathable while adjustable side tabs add a unique style feature and a customizable fit. This one inspires countless layering options: over a hoodie, tee, woven shirt, short sleeve, long sleeve…you get the idea. The fresh silhouette of the Foster Leather Vest includes matte leather, straight sides, snap waist tabs, mandarin collar, and reflective material. We also updated storage solutions on our men's leather vest with extra-large interior zipper utility pockets. 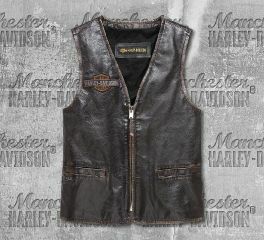 The Pathway Leather Vest features adjustable sides for a custom fit.